Villa-Osprey...your vacation begins here ! ...then Villa-Osprey is for you. 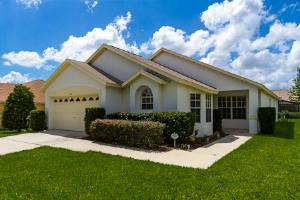 Located on the upscale community of Orange Tree, only 8 miles from Disney and ideally situated for the numerous restaurants, malls and championship golf courses nearby. Whether your vacation is destined to be 'hustle & bustle' at the attractions or peace and tranquillity, enjoying the serene surroundings of Orange Tree or enjoying sporting challenges on the tennis & basketball courts, a short walk through the orange groves, Villa-Osprey can satisfy all. 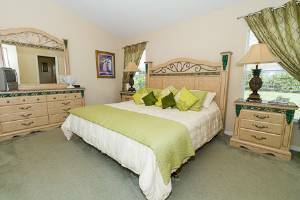 Having 4 bedrooms, 3 bathrooms and a large family room with vaulted ceilings, our vacation home offers the flexibility needed to accommodate either family reunions, 2 families sharing or a family just wanting space to relax. 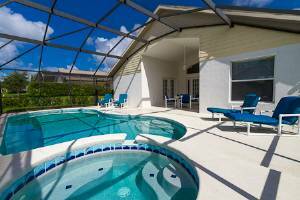 Imagine enjoying breakfast on the pool deck lanai, then a quick dip in the refreshing crystal blue waters of the 30'x 15' pool before setting off to the attractions or malls...close enough to Villa-Osprey allowing you to return home through the day to recharge your batteries for the evening ahead. 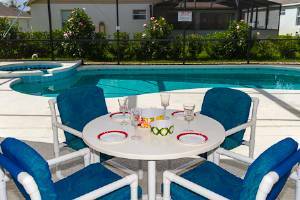 Villa-Osprey can make the difference between a good vacation and a lasting and treasured memory of a great vacation. * A stone's throw away from Walmart, pharmacy, Publix and many other shops and restaurants. Cribs, high chairs etc., available from our vacation home manager for a very small hire charge (this way they are always well maintained and cleaned - safety is paramount). 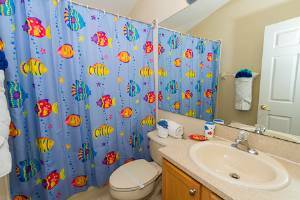 We can accommodate up to ten people in our home. We are sorry, pets and smoking are not allowed in our home. Further activities are available at Lake Louisa State Park, only 5 miles north of Orange Tree. 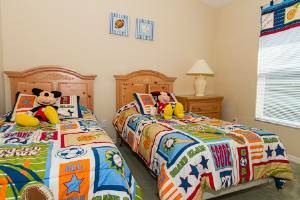 Welcome to our 4 bedroom luxury villa close to Disney. We are just back from the vacation and wanted to let you know that we had a great time in florida. A major reason for that was the villa and all the arrangements in the villa that were perfectly taken care of. We were really pleased with how well everything we needed was available by the time we reached. The villa itself is very nice, especially the swimming pool area. We are sure to return back to your villa for our future visits and refer the villa to our friends who might be visiting. Thanks again! Traveling with an infant can be challenging. Having the comfort of a house rather than a hotel room made the experience much easier. The house was/is immaculate, the pool and sauna crystal clear and clean. Barry and Finola are a pleasure to deal with, and the management company is very responsive. There is a Publix and Walmart a stone's throw away. 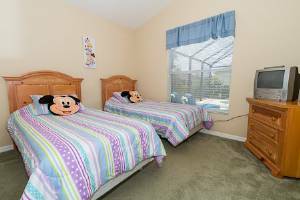 It is also ideal for those visiting Disney, as it is close enough to the parks without being too close as to interfere with the tranquil setting of the house. It is a bit farther from Universal, which was our destination, but we didn't mind that at all. We have all intentions of going back to Villa Osprey....we had a wonderful time!! Thank you so much for the opportunity to rent your beautiful home. We rented the home from April 14, 2012 through April 21, 2012 when we took our family to Disney world. The house is beautiful and very clean. We were very pleased with all the “extras” the home offers. The game room offered many hours of entertainment for the entire family. Our 2 younger sons enjoyed the PS2 system in the bedroom. Also, the sports equipment supplied to us allowed us to use the basketball court and tennis court. A lot of thought went into providing everything we might want/need to make sure our stay would be enjoyed. The beautiful pool and hot tub were wonderful and gave us many hours of relaxation and enjoyment. 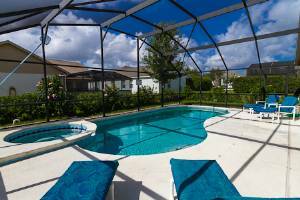 When we were looking for a villa to rent for our vacation in Orlando, we came across Villa-Osprey and found it to be the best option for our family. It is spacious enough for two families with two kids each and has all the amenities that one would need on a short-term or long-term vacation. We felt very much at home. Any issues were taken care of right away by the owners and the management company. We absolutely loved the pool and the spa. Both have night lights and look lovely in the evening time. The community was quiet and clean. It is in a great location with plenty of nearby restaurants, grocery/department stores and theme parks within 30 minutes driving distance. One can buy a small amount of soap for dishes and laundry at the nearby stores (like Walmart or Target). We did our grocery shopping at the Publix store that is less than 5 minutes from the villa. We had a lot of fun and have already started recommending people to stay at Villa-Osprey! Gas pool and spa heating available for additional charge - contact owner for details. Deposit: See owners website for full details. Other Fees: Short stay surcharge may apply.